Now the end of October is here and winter is on its way, we bring to you another collection of newly available products from VioVet. It is an exciting time for hungry dogs as Barking Heads release their AATU 80/20 range of quality dry food. 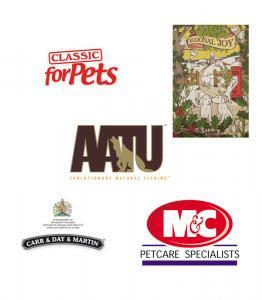 We have a selection of Mark & Chappell products for your cat which provide a tasty treat with various added benifits. There are additions to the Carr & Day & Martin range of products for tack and horse care. For the small animal owner there are a range of soft beds for your pet's cage which we are sure they will love to snuggle up in during the winter period. Finally, as the Christmas period approaches would like to highlight the exciting addition of the Lily's Kitchen Advent Calendar for dogs. Barking Heads and their sister brand Meowing Heads have long been a popular range of pet foods here at VioVet. Not only because the pets that feast on them enjoy every bite, but because they only contain ingredients that they should be given, those that are good for them. Now enters a new range of dog food called AATU, which stands for 'Noble Wolf'. This is due to the fact that the diets have been produced to closely relate to the intake of wolves, of which our pets have the same common ancestor. Available in Chicken, Duck and Salmon & Herring, each bag consists of a mixture of 80% freshly prepared meats with 20% fruit, vegetables and botanicals. Not only does each meal bring multiple health advantages with all the fresh ingredients, but there is no grain, potato, artificial colours, preservatives or gluten, just high quality produce. Mark & Chappell have been providing our customers with a wide range of healthcare products used to make the pet and owner's life a lot better without huge costs. This month we have seen the addition fo four new treats for cats and kittens which have each been developed to support essential areas where they may need some extra support. Healthy Bites is the range in question, and for kittens there is Nutri Booster which provides a range of nutrients to aid in overall health during growth, as well as Teeth & Bones which provides balanced minerals to help better develop strong teeth and bones. Breath & Dental treats are suitable for adult cats and kittens too, and help to clean tarter off the teeth which keeping their breath smelling fresh, and Urinary Care which can help to maintain a healthy urinary tract in both adult cats and kittens. With all these added benefits, and an enjoyable taste to match, there is no reason why you shouldn't treat your cat with some Healthy Bites today. Carr & Day & Martin are the UK's oldest manufacturer of horse coat, hoof and tack care products and have been a popular fixture for our equine customers. This month has seen three new products which can help to ensure your horse and equipment are always looking their best. For all your tack cleaning and conditioning needs there is the 2-step Tack Cleaner and Tack Conditioner, which help you to clean your equipment without the need for scrubbing, before applying the conditioner to protect and add shine to the leather, all with minimal fuss or effort. MF Pro is a complete kit which helps to clean, revive and protect areas which become especially vulnerable over the winter months. Included with the kit are an antibacterial cleanser, antifungal balm, salve barrier, leg wrap and horse care sponge. For the small animals this month we have a number of products which are perfect for the colder end of the year. Classic by Caldex have released a selection of beds to add to your pets cage, each with comfortable inners so your pet can snuggle up and rest when they want to keep warm. Suited more for rats, ferrets, hamsters and small guinea pigs, there is a Cuddle Up Igloo, Double Bunk Hammock, Rodent Hive, Fleece Centre Hammock, Quilted Hammock, Tunnel Tube, Snuggle Up Slipper and Fluffy Pouched Hammock. A great selection that is sure to suit all that lie and play in them. Each comes in a wide range of coloured designs so you can get one which suits the mood of your cage and it's surroundings. Christmas comes only once a year, and it is certainly fast approaching, noticably more now the cold and dark evenings set it. The VioVet Christmas Shop is now open with a wide range of toys, treats, clothing and more for your treasured pets to get ready for the joyful period. A great way to count down December until the big day with your dog is this years Lily's Kitchen Advent Calendar. Each door hides a bag of delicious, oven-baked treats for your dog to keep them going until feeding time, as well as a charming illustration for you to enjoy. What's more, these treats are low in fat and have no artificial flavours or preservatives at all, so no need to worry about treating them each day. No need to worry if it's not a dog you are looking for Christmas gifts for, we have a wide range of advent calendars, toys, treats, clothing and more ready and waiting in the VioVet Christmas Shop.